Invisalign clear aligners offer a wonderful alternative to visible metal brackets and wires. This orthodontic treatment can bring your teeth into the proper alignment subtly — which is worth a lot to busy professional/socialite adults. But even still, you will need to wear the clear aligners 20 to 22 hours a day. That’s got to be a drag on your social life, no? They’re still sort of a hassle, right? Wrong. You can still have a great night out while wearing Invisalign aligners. Keep reading for 5 top tips on how! 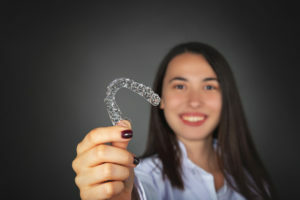 Remember that you need to wear your aligners for 20 to 22 hours each day, which means that for very, very important occasions, you can feel free to take them out! If you’ve got a big meeting or occasion coming up, feel free to slip the aligners out — storing them properly and then reinserting them as soon as possible after. To avoid accidentally throwing your aligners away or damaging them, make sure you store your Invisalign trays in their special hard case ANY TIME they are not in your mouth. Damaged aligners can lead to delays in treatment, which ends up costing you more time and money. You can drink water with your Invisalign trays in, but anything else will be too harsh on the plastic. Plus, it could get lodged between your tooth enamel and the trays, increasing the risk of developing tooth decay. Take out the aligners before you sip that cocktail — and make it a light one, too. The pigments from red wine and dark beer will grab onto your teeth and could be transferred over to your aligners when you put them back in. Avoid that by sipping white wine or other white/clear beverages that you like. Sipping on water throughout the night will help you enjoy the evening without having to remove your aligners — or, you can use it to rinse your mouth you if you don’t have time to brush your teeth before popping the aligners back in. You need to brush your teeth thoroughly before reinserting the aligners after eating or drinking anything other than water. Not doing so can cause food particles and plaque buildup to become lodged between enamel and aligner and accelerate the rate of tooth decay. After dinner and before you start the evening, take a few minutes to brush your teeth to ensure they are clean and your breath is smelling fresh. There you have it! 5 pro-tips for having a great night out with Invisalign. And before you know it, the treatment will be up and you’ll be smiling with full confidence EVERY night out. Premier Dental Care offers excellence in dentistry for families and individuals. If you are interested in learning more about the benefits of Invisalign, don’t hesitate to contact your cosmetic dentist in Herndon! Call Premier Dental Care at (703) 860-8860.